Technology is an ever-evolving part of our day-to-day lives. It is constantly developing and whether we decide to embrace it or not, it has already made its way into our homes. From smartphone apps that let you control your lighting to CCTV devices that let us keep a watchful eye over our homes, digital technology is hard to avoid and is even making its way into our bathrooms. Traditionally, bathrooms have always been functional but the latest developments in technology have made winding down after work a more luxurious experience. 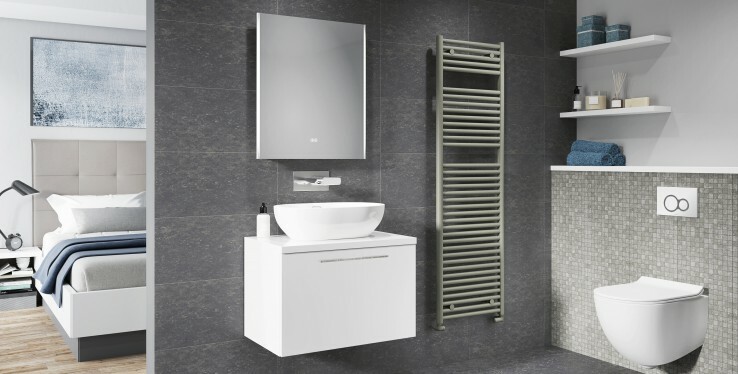 Firstly, we had the radiator that doubles as a towel rail and under floor heating to keep your bathroom toasty during the colder months. Next came the combination of soaking in the tub while watching TV, this was a must-have trend that took the industry by storm, so, what's next? The very latest trend has now made the mornings a more fun experience allowing you to listen to music through the bathroom mirror whilst getting ready, multi-tasking at its best! Our brand-new Angelo LED Mirror is a new multi-purpose product that allows crisp sound to be brought into your bathroom, shower room or washroom. Smartphone and tablet devices can be connected to the digitally enhanced mirror, allowing you to access your own personal library of music. Whilst the ability to connect via Bluetooth opens up a variety of options to play app-based radio or stream music via apps. This technological advance lets you play a range of music from the palm of your hand, never will your bathroom experience be the same! The Angelo LED Mirror is now available at Real Stone and Tile! Pop into our Cheadle showroom or call us on 0161 485 1373.